Jacinda Ardern has followed up her speeches in New York with her contribution to a Stuff series: What it means to be Kiwi, examining the changing values that define New Zealand in the 21st century. Don’t mistake Jacinda Ardern’s kindness for weakness, she says. “There is criticism around different leadership styles, and I receive my fair share. But the fact I still maintain my view that there’s a place in politics for compassion and empathy, that probably proves that I am strong”. That seems to be in response to claims that back in New Zealand her leadership has shown weaknesses. “Regardless of our own personal beliefs, we actually tend to want other people to have their own ability to live their lives. Ardern said the Government’s wellbeing framework was an attempt to put Kiwi values in action. “Part of the reason I raised actual kindness is there is an assumption these are values you can’t bring to life in politics or have no place in politics. “I do think that you can embed it in what we do when we govern as well. We are trying to bring in a range of indicators that tell us a bit more about people’s lives,” she said. When measured, it could provide a sense of people’s wellbeing and their happiness, she said. Sounds wonderful but is absolutely vague feel good stuff. Ardern is yet to prove she has the strength and leadership to put at least some of this into practice to drive positive changes. New Zealand – well the news media anyway – basked in her reflected glory. But there was plenty of chaos going on back home – most of it right in the heart of Ardern’s own Government. Revelations about Meka Whaitiri’s bruising set-to with her press secretary were by far the most serious. Allegations that enraged by a missed photo call she injured the woman are serious enough for a party whose founding values are standing up for the worker. But, add to that the unconditional and blind support of employment minister Willie Jackson – without even a cursory examination of the facts. The overwhelming impression was that the Maori caucus holds too much sway. That, and after just a year in power, the party is happy to abandon its principles for convenience. Then came geek entrepreneur Derek Handley, chaperoned by arch-Tory Michelle Boag. He first embarrassed the Government by overtaking their process of releasing communications about the chief technology job he won, and then lost. Further documents revealed the fingerprints of Labour party president Nigel Haworth and former apparatchik GJ Thompson. Ardern was more heavily involved in the process than previously let on. Importantly, the State Services Commission ruled the appointment robust and unbiased. But the cache of documents left the lingering hint of cronyism and a reluctance to share all the facts. Although the involvement of Boag did give off the whiff of dirty politics, and diminished National’s attempts to take the moral high ground. The Wally Haumaha appointment scandal continued to dog the Government. The links between NZ First and the former cop and one-time candidate should preclude any of its MPs from being involved in the investigation into his promotion. Yet, both Tracey Martin and Winston Peters have been at the heart of setting it up. They might be entirely blameless, but their involvement tarnishes the credibility of the entire process. Ardern should luxuriate in being a shining beacon of hope in New York. Because when she gets back home, there’s plenty of murk to cut through. If Ardern has as much strength as she claims she needs to urgently address these messes. Assuming you do too sorethumb, can we assume you were against privatization, ‘free markets’, globalization, “a level playing field” and all that *crap* all along? Start from a wrong premise and what follows is … wrong? Have you asked people who fill those jobs what they think of them? They may not have your first world perspective. Their jobs may be the difference between hunger and eating for them. They aren’t forced into that employment. What human rights? As if things would be different with an absence of Western corporate concerns in those countries. Trying to make the fact line up with your philosophy, Parti? Ardern said she wouldn’t use a taxpayer funded nanny for her trip, suggesting she was being frugal, but is this money well spent? Or a PR junket? Jacinda’s UN visit was a huge success but WHATABOUT????????? Do you think that three taxpayer paid photographers was money well spent? Wouldn’t it have been better for James Shaw to have gone with Ardern to help promote what the Minister of Climate Change is actually doing on climate change? Do Prime Ministers usually take photographers to high-profile events? I bet they do. Is there value to New Zealand from images taken of Jacinda, Clarke and Neve and published throughout the media? I bet that in this instance, the value is HUGE, more so than for any other Prime Minister we’ve had. Have past Prime Ministers spent money on public relations media whilst overseas? As this has morphed into the “WHATABOUT” blog, I can safely remind you that John Key used taxpayers money to buy his way into the American shows that this time around, scrambled to invite Jacinda to appear. This quibbling about photographers is petty, Pete. This PR-obsession business might be getting out of hand – look at the trouble it’s caused one ex-Minister already. I would be surprised if PMs generally expected the rest of us to pay for three fashion photographers to take flattering photos at these events. What about the press who are there anyway ? That speech is just woolly thinking. It’s like the ad that told us how good geese were when they flew in formation. In my experience, no they don’t. I have previously worked in Government both in NZ and in Embassies overseas, and I have never known photographers to accompany the PM. Most photos are taken by either the host nation if at an official event, or by Embassy staff in non-official meetings. Never have I seen a PM travel with one photographer let alone three. This is a gross waste of Taxpayers money. Speaking from the UK, no there isn’t. Hardly anyone here knows her name, let alone her partner and baby’s names. The most talked about thing to do with NZ over the last few months was the ban on foreign house buyers, policy is what matters, not PR opportunities for a PM who seems to be devoid of ideas when challenged. When some of the PR has cut through most of the comments in the media have been quite negative about her, it hasn’t provided any benefit to NZ. You are going to defend hiring 3 people to take photos of her Robert, come on defend the expenditure…thought not. As a taxpayer I am delighted that I have funded babies first trip photo album, how many private photo,s of baby Neve do you think we funded. I will say that Jacinda’s hair & makeup adviser and dress-style guru were worth their money. She looked nice. She can look a bit rough when she’s doing the business here. Long straggly hair on someone hitting middle-age is not flattering and makes them look older, not younger. CG looked very scruffy at the UN. Doesn’t he own a tie ? Three ad agency photographers is three too many. I assumed that the photos etc were done by the news people who were there. But three vanity photographers having a nice trip to NY at our expense is not on. I can’t see that NZ as a whole has benefitted from the photos of the happy family; how could it possibly do so ? It’s been a big ego trip for JA, but she’s had her 15 minutes. NEXT ! To be fair, Kitty, Clarke’s pretty much had to grow a beard. He’s stuck at home with the cooking and cleaning and child-minding & he’s got a well-cultivated macho rep that he’s possibly a bit worried is slipping away. Freddy Mercury was the star of stars, wasn’t he ??? I had his bio until I gave it to someone else who loves Queen. People have to be born with that sort of star quality. How one wishes that he hadn’t died of AIDS. And she disclosed she would use these for campaign purposes before back tracking, she is a bit slippery. Robert you would be apoplectic if Key had hired a photographer to take flattering shots of him, I would have been to. There is no benefit to anyone except the Labour Party of photos of her appearing in NZ as you said the value is “huge” for her. Is having a staffer taking a shot of her not good enough for our Princess, does she need the right lighting and shading and a bit of touch up work, take a couple of hundred shots and have a professional go through them so little Miss Vanity can get that one or two great shots. Is she running the country or auditioning for NZs next top model. Its not the Kiwi way. get some guts…or this bloke will sort you out! He did, David, he most certainly did. We’re you living under a rock during Key’s campaigning period? I won’t link to his plethora of “flattering” photos but to believe you didn’t see any at the time is…difficult. I bet that he didn’t hire fashion photographers at tax payers’ expense. I bet he did. You see what he was like in the raw? Those photoshoppers had their work cut out for them. Lizard eyes are really hard to give life to. That photo of Key by the pool – erg!! (not “ergonomic, errrrrrrrg! Perfectly encapsulates Jacinda: PR PM. I hope that these remarks about our Jewish PM have nothing to do with his being Jewish. And yes, he is Jewish, he can’t not be if his mother was. Jewish law. Can you tell from the contours on his swimwear? Since we’ve moved into the zone, let me label Kittycat a grammar nazi – or would that be anti-semantic? And she is also a costume nazi! But any seman will have been washed of John’s. Notice the avatar the universe has assigned me. I can tell because his mother was Jewish, ergo he is Jewish. For what its worth, I’ve traveled overseas with former PM Key a number of times, as well as worked around him domestically. I’ve not traveled internationally with PM Ardern. There was a period Key’s first two terms where a staff member from either the PMO or the Leader’s Office accompanied the PM on all domestic and international trips that I went on with the sole purpose of taking photos of PM Key in action. In my memory, this was a new development from PM Clark. It was partly an acknowledgement of the new impact of social media and the increasing demands of online news cycles, and partly a reaction to media organisations pulling back from overseas trips because of cost. This photographer was part of the official party, and as such had access to events where the media were not allowed. Some bi-lats allowed a quick grip-and-grin at the beginning, and some did not. 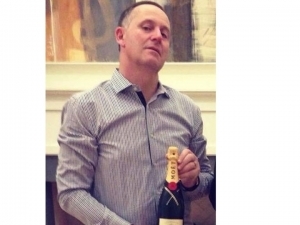 PM Key’s photographer would then make sure his photos were available to all NZ media. From the NZ Herald article, it appears that this protocol was the same in NY. I recall on two occasions in the 2013 South America trip that the local embassies had an official photographer present as well as the PM’s staff. I dont know whether they were MFAT staffers or local hires, but suspect the latter because they both had professional gear and acted as professional snappers, not staffers handed a camera. I dont know what budget PM Key’s official photographer’s costs (wages, flights, accomm, etc) came from, either the Leaders Office (taxpayer funded) or National Party coffers. The issue of savings made from using NZDF 757 flights seem as bit of a red herring. PM Key used the RNZAF aircraft a lot more than PM Clark, partly so that NZ media would take advantage of the subsidised flights. I would think the costs involved in travelling via the 757 were vastly more than using first class on commercial carriers. To my way of thinking, I see very little difference between the actions of PM Key, and those reported about PM Ardern. So metro..so now..so redundant at the next election. It’s quite true that if you want to see if a policy makes sense, reverse it. Whose policies would include promoting unkindness, material deprivation, making sure that people were not earning, learning or volunteering, encouraging them to be UNcaring and ensuring social isolation ? Nobody. It’s just talk with no real meaning. The costs that people are objecting to are the three (!!!) photographers paid to take vanity photos that the people of NZ are paying for (and which will be used for election campaigns) and the taxpayer funded $100,000 taxi ride in an Air Force plane so that the PM didn’t have to spend two days away from her baby. Jacinda won plaudits internationally; exception positive media coverage, notable applause from the Assembly, exceptional and valuable comments about her values and the attractiveness of her country, but here in lil’ ol’ NZ, we’re all but WHATABOUT, especially here on Yournz. Bunch of Eeyores. Anybody know how many Sir John had? To get ahead, you gotta give it. Johnboy showing he has what it takes. What Ardern is doing about things in New Zealand is kind of important don’t you think? And what her government is doing? Do you think we should have a month of uncritical worship or something? Mediawatch says her speeches and “world leader” status were overhyped. people have been having babies for years. Has anyone told HER that ? Apparently it’s a world first for a PM to have a baby whilst in office and not be able to do her job properly? Turns out the.US photography firm Ardern hired was a Labour Party donor. Lucky NZ doesn’t have the same laws against foreign political donors as the US isn’t it? Sounds dodgy – Labour give taxpayer money to Labour donor who could well then pass it back to Labour as a ‘donation’ for reuse in their election campaign. take a look at the Nats donors..Sky City for example..no competition…no chance for any rivals. The photographer has the potential to really upset the voters, domestically will over shadow the positives of her trip. Must be wearing a pair of those super-slim ear-muffs and I notice his steel-toed safety boots are cleverly painted to look like he has bare toes. The lawn looks like mine. It looks ‘photoshopped’.. piggy’s head cut onto a smaller mans body ?! its the real thing…Rob mowing his lawn at his bach.Look how long the lawn is. I can use abusive names too..
just because an authoritative fascist has passed away, does not mean we should change our opinion & say ‘what a great guy’.. double-standards are B-S ! Hadfields Beach wasn’t it? Like the petrol can in the background. Probably just as well he didn’t have a tractor. Zedd, we got the old, old joke the first time, no need for endless repetition. Not the Blue Steel look I was expecting. He must have only had two photographers and not three that Jacinda had. The comments on that article are scathing. Ardern only fools the most ardent supporters – having to remind everyone that you’re ‘strong’ through a dedicated PR drive when your actions to date don’t match that rhetoric suggests the opposite is true. Bridges is not much better and really in parliament today there is little evidence of anybody with strong leadership ability. riding to hospital on a bike to give birth!-lost ..me. These things can happen if you’re a maniac. “ Incredible that any of them survived!!! Any of them survived ? Who are ‘them’ ? You can’t be using ‘any of them’ to refer to two people. It’s her baby and if she values publicity more than its life and safety, that’s up to her. I don’t know if there are laws against this idiocy. It may be that nobody would expect any woman 9 months pregnant would be so stupid. Winston is such a strong leader he’s had to go to great extent to implement the waka-jumping bill to maintain order of his handful of MPs. Isn’t he drunk 50% of the time? Winston Churchill about 70% of the time. Bridges is on 10% support & Jacinda is above 40% ! All that proves is that the left are happy to be lead by an ineffectual leader whilst the right aren’t. the last 2 National leaders are quitters….even ‘serious’ contender Coleman…bailed. What ball park ? This is NZ. Who is the leader who’s charismatic and kindly ? Not our PM, anyway. I still reckon people who use “lead” instead of “led” for the past tense of “to lead” are poor at English. I’m an amongst kinda guy. I dove into that. You dived. 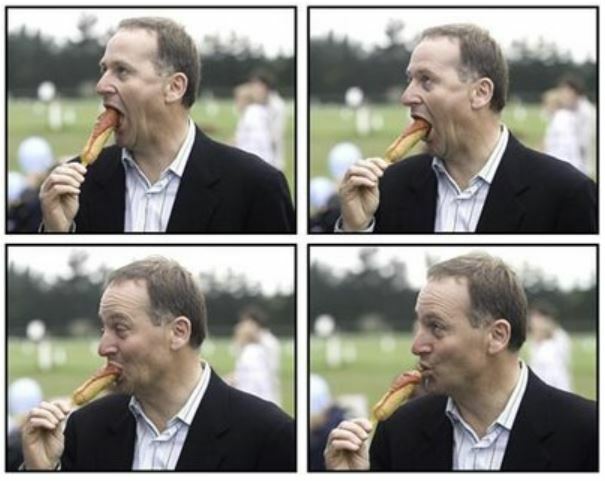 Max, in the ball park, John Key not able to attend soldiers service, in ball park…Max!! We don’t talk about ball parks here, this is NZ not the US. Pled, Kitty? You’re a snob. It is common – in the worst sense of the word. Only very common people use it. You dove ? Spare me. I hope that you don’t actually say this. “Dive, which was originally a weak verb, developed a past tense dove, probably by analogy with verbs like drive, drove. Dove exists in some British dialects and has become the standard past tense especially in speech in some parts of Canada. In the United States dived and dove are both widespread in speech as past tense and past participle, with dove less common than dived in the south Midland area, and dived less common than dove in the Northern and north Midland areas. In writing, the past tense dived is usual in British English and somewhat more common in American English. Dove seems relatively rare as a past participle in writing. Dove? Yes, love it (rhymes with “dove”. Common as muck, me. In some dialects, ‘druv’ is heard, but the verb dove doesn’t rhyme with dove the noun. It rhymes with “bit” – oldy but a goody. Are you the oldy but goody ? Can you read this aloud ? Said ‘Look at my muscles; I’m frum. ‘Spare me’ is like saying ‘Stop it.’ or ‘Carry on.’ There is no need to specify what one wants to be spared, or wants the person to stop or carry on doing; it’s obvious from the context. Jacinda will be on 95% following her spectacular UN visit. That would have her up on the same cloud as you, Robert. Alan! You’re so kind. Must be Jacinda’s influence. She has the alchemist touch, turning dry flint into cotton wool. From one fluff to another. “Stay-at-home Dad” Clarke Gayford now pictured in New York – just like every other house-husband. I can see them all relating right now. Yeah! Stay-at-home-Dads/house-husbands are … Alan?? Herd of wilderbeasts, Alan, not men. Kept comfortable ? Kept tame ? Stay at home dads are … fluff, Alan? (You said). Have you never heard that phrase robert? Usually applied to women. Men are the people with dangly bits, Robert. Women don’t have dangl\y bits, we have sticking-out bits on our chests. Keep it seemly please. Children post here sometimes. I reckon. Ray – do <i. you rate her performance on Colbert as “poor”? Is that the spectacular UN visit where the GA was almost empty when she gave her speech? Worse than May in Salzburg the other week! And that was bad…. she doesn’t pick the order of the speakers. Trump had a big crowd…because he is a good speaker!!! Apparently saying ‘comrade’ in a speech a dozen or so times is what it means to be a Kiwi nowadays? Must be a Morrinsville thing. Don’t know Blazer, haven’t been to Morrinsville in a while? They could be all wearing ushanka there now for all I know. you summed up- ‘ for all I know.’. You’re misusing this term Robert, a bit like this govt. Blazer asks you if Jacinda’s repeated use of the term “comrade” was recent and you answered, “Don’t know”. You’re a bit slow on the uptake – he didn’t actually specify what his comment “recently?” was related to so I took it as relating to my comment “Must be a Morrinsville thing”. Not a Morrinsville thing, I have family from there and they don’t say it. Pretty sure comrade is a Communist thing. (among men) a colleague or a fellow member of an organization. a fellow soldier or member of the armed forces.